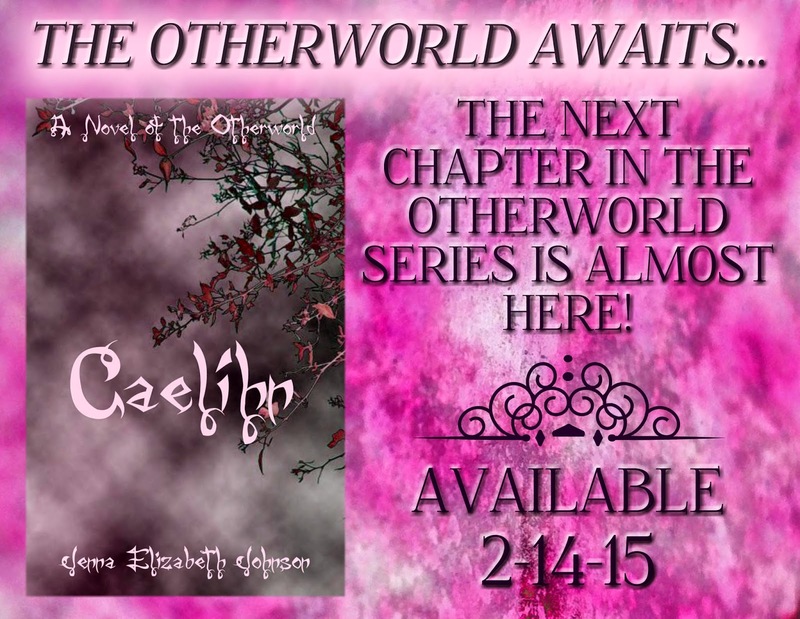 Jenna Elizabeth Johnson: Valentine's Day Interview with the Characters from Caelihn! Valentine's Day Interview with the Characters from Caelihn! Hello Readers! I have been insanely busy this past week getting ready for the launch of Caelihn - A Novel of the Otherworld! It will soon be available in ebook format from most places where ebooks are sold, and you can now order the paperback edition from Amazon.com. In order to celebrate the next chapter in the Otherworld Series, and since it is almost February 14th, I sat down with the characters from Caelihn and asked them some questions about what they would like to do with their significant other for Valentine's Day. Here are the questions and their answers. I hope you enjoy and feel free to comment and ask your own questions as well! 1. What is your opinion on the Valentine’s Day holiday? - Meghan – It’s okay. I really never was a big fan of Valentine’s Day, but it’s a little bit different when you have someone to celebrate it with. - Cade – I don’t know much about this holiday since it is a mortal world invention. Meghan will have to fill me in. - Robyn – I think it’s just another way to get people to buy stuff. I mean, it was fun and all when I was a kid and we got to exchange cards in school, but not anymore. If you’ve got someone to celebrate a relationship with, you don’t need one day out of the year to do it. You can show your appreciation for your significant other in little ways throughout the year. - Devlin – I’m with Cade. I don’t know much about it, only that it’s a day set aside to do something special with the person you love. 2. If you were to take one of your readers on a Valentine’s Day date, where would you go and why? - Meghan – In the mortal world, I would treat them to a night out in the old Arroyo Grande Village. There is a lot to do there and it’s nice just walking around and hanging out in the small park by the swinging bridge. - Cade – If it was possible to take them to the Otherworld, I would take them to Luathara Castle. We would enjoy a candlelit dinner on the terrace (if it wasn’t raining) and then a walk through the gardens or through the woods nearby. - Robyn – I’d probably ask them where they’d like to go first, then decide from there. Skydiving might be pretty awesome. - Devlin – If we were in Eile, I would take them out in a small boat on Lake Ohll. We’d paddle out to one of the islands and have dinner by a campfire and watch the stars come out. - Meghan – someone with a kind soul who appreciates the little things in life. He would also have to be compassionate and fight for what he believes in. - Cade – Integrity, loyalty to loved ones, strength of spirit and mind, compassion and probably the most important: an open mind about many things. - Robyn – I look for a guy with an adventurous spirit and a passionate soul. I’ve been told I can be somewhat prickly at times (though I don’t know why anyone would think such a thing), so someone who can look past my sarcasm and tough-girl attitude and see the real Robyn is a winner in my book. Oh, and it wouldn’t hurt if he was hot. - Devlin – I look for a fierce heart and a passionate mind in my mate. I admire people who continue to persevere even in the face of adversity. 4. In your opinion, what is the best way to show someone you love them? - Meghan – With your actions. People aren’t always honest with their words, and sometimes it’s hard to find the right thing to say, but if you pay attention, you can usually tell if someone loves you by how they treat you and act around you. - Cade – Do what you need to do to make them happy and safe. Sometimes that means sacrifice on your part, but that’s what loving someone is about: being selfless for that one person you care for the most. - Robyn – Be there for them when it’s tough, even if that means something as easy as being a shoulder to cry on or knowing when to give them space to work things out on their own. - Devlin – Sometimes it’s the little things you do to let them know they are appreciated. Leaving small gifts or laughing at their jokes (even if they aren’t all that funny). 5. What would you like to do with your significant other this Valentine’s Day? - Meghan – I would just love to spend time with Cade without being interrupted by some crazy evil thing wreaking havoc in Luathara or anywhere else in Eile. One day of not having to deal with the Morrigan’s aftermath. - Cade – I’m with Meghan on this one. Maybe even take a day trip into the mortal world and do some normal, mortal world thing humans do on Valentine’s Day. Go out to dinner in a restaurant or go see a movie or walk on the beach. Some peace and quiet with the one I love would be much appreciated. - Robyn – I like Cade’s idea of going back to the mortal world for the day. Devlin and I could go for a hike in the hills surrounding San Luis Obispo and then maybe get something to eat at one of my favorite restaurants or visit the Green Tea Leaf and see how everyone is doing. Then, we could go see another movie (maybe I’ll let Devlin pick this time). - Devlin – I don’t care, as long as I get to spend time with Robyn. 6. Stay in or go out? - Meghan – I’m a stay in kind of girl. - Cade – This all depends on what we’d be doing, but I’m leaning towards staying in. - Robyn – I think a double date with Meghan and Cade back in the mortal world would be a blast. - Devlin – Maybe go camp out in one of the hidden corners of the Weald for the night. - Meghan – I would appreciate either. - Cade – You mean what I would get for Meghan? Probably both, and maybe something else from Kellston, like some artwork for her small study in Luathara Castle. - Robyn – Both! Duh! - Devlin – Would it be unmanly of me to admit I wouldn’t mind getting some flowers from Robyn? And maybe some chocolate for the two of us to share after dinner. 8. Finally, if you could get anything for your Valentine, what would it be? - Cade – I would like to find Meghan’s father, if he is still alive in Fomor. I know that she regrets not knowing him, even though she doesn’t speak about it. Of course, this would mean convincing Danua to tell me more about him, but I feel it is a sore subject with her as well. - Robyn – If it was in my power, I would talk Danua into giving Devlin Diarnan Castle. Since I don’t think that will be happening, I’d like to find some bitterberry bushes to plant in our garden in the Weald since they are his favorite. - Devlin – I would find Robyn’s family in Eile and do everything in my power to make sure they do not shun her the way her family in the mortal world did. I would also like to find the Daramorr and his sister and make it so they can never hurt Robyn again. Thank you for reading and I hope you enjoyed this interview! You can still pre-order the ebook edition of Caelihn - A Novel of the Otherworld from Amazon.com, Barnesandnoble.com, iTunes.com and Smashwords.com. It will be released on February 14th, 2015.